September is National Bourbon Heritage Month. So this month we can celebrates its ninth anniversary reinforcing the 1964 Act of Congress that declared bourbon “America’s Native Spirit.” Passed unanimously by the US Senate, the bill inspires the celebration of the indigenous Kentucky spirit, moderately, all month-long. 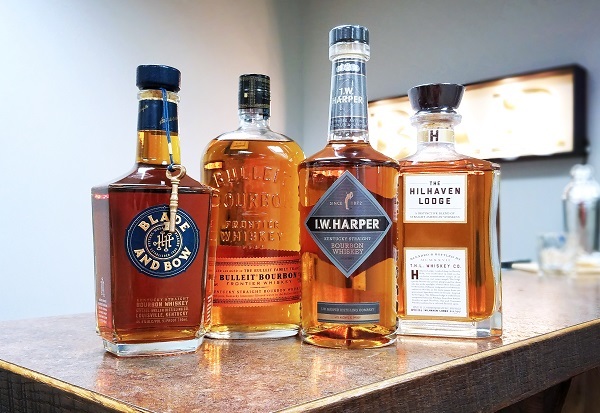 So to celebrate here are some fantastic bourbons that you can pick up and enjoy responsibly this month. Tom Bulleit originally considered calling Bulleit Bourbon, based on his great, great grandfather’s high-rye recipe, “Thoroughbred Bourbon.” Bulleit Bourbon can be found nationwide, but lucky consumers in Kentucky may be able to get their hands on the newest addition to the family – Bulleit Barrel Strength. Blade and Bow’s five keys represent the five steps of crafting bourbon. The sixth “unofficial key” is southern hospitality, which Stitzel-Weller Distillery’s Carol Perry has showcased every day for the past 45 years as the Stitzel-Weller Distillery’s friendliest face and head greeter. In 1927, The Hilhaven Lodge was built and the first “talkie” film “The Jazz Singer” was released, significantly impacting the entertainment industry. The Hilhaven Lodge is a new release for 2016 in partnership with Hilhaven Lodge’s owner, Hollywood producer and director, Brett Ratner. Since the launch of their very own fashion line in the height of their popularity in the 1940’s, I.W. Harper has long been immersed in style. The brand honors its stylish roots today with Goorin Bros. and “The Harper” – a premium felt fedora featuring the I.W. Harper’s iconic “Bowing Man” on the interior available for a limited-time this holiday season. Check out this recipe from I.W. Harper. It is a whiskey smash cocktail. Print article This entry was posted by Art Eddy III on September 9, 2016 at 10:39 am, and is filed under Lifestyle. Follow any responses to this post through RSS 2.0. Both comments and pings are currently closed.